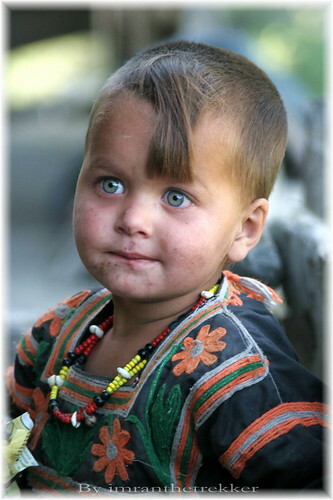 The Kalash are an indigenous people of the Hindu Kush mountain range, possibly descendants of Alexander the Great's army (though some geneticists dispute this). They speak a language distantly related to Greek and practice a polytheistic religion that to this day involves seasonal festivals celebrating the three main gods protecting the herds--Sorizan, Goshidai, and Balimain--and animal sacrifice, particularly of goats. Kalash customs differ drastically from those of the Muslim population surrounding them: men and women mix freely, women don't cover their faces, marriage by elopement is common, and women can change husbands if the new husband is willing to pay twice the dowry of the old one. Girls and women are sequestered during menstruation and childbirth, however, until they regain their "purity". According to Wikipedia, the Kalash population stands at about 6000 and UNESCO considers the Kalasha language critically endangered.